Pros: Spectacular design, interesting concept, and excellent performances, particularly in moments of humor. Cons: The content was a bit dense – made all the more complicated by the inconsistent attempt to update the era and language. Our Verdict: An interesting and unique work, but the production fails to revitalize this Spanish classic for a contemporary audience. When you first enter the Olivier Theatre at the National, you won’t be able to help being struck by the rocky mountain range erected on the stage, rising up beneath looming cathedral windows that close off the sky. This is the set stage for their reworking of the Spanish classic, Damned by Despair. The design is appropriately grand, as the production’s subject matter is overwhelmingly grandiose, asking questions such as: what must one to do reach salvation? Does God hear us? Does he communicate to us? Can we understand him? The play is the story of two men – Paulo, a saintly hermit who fears that he will never achieve what it takes to please God and enter heaven, and Enrico, Paulo’s foil in every way, who keeps the city of Naples living in fear, who kills mercifully, and harbors no doubt or fear. The devil (brilliantly portrayed by Amanda Lawrence), conspiring to use Paulo’s burgeoning doubt to turn him to darkness and wreak havoc on Naples, takes on the guise of a heavenly messenger and convinces Paulo that he must find Enrico and that whatever Enrico’s eternal fate will be, so also will be Paulo’s. What follows is essentially a morality lesson on the values of good works versus faith, and what it takes to truly achieve salvation. The National’s production makes a valiant effort to bring this lofty subject matter down to earth by incorporating modern language and setting. After an opening scene with Paulo praying from the mountaintop and his unwilling sidekick Pedrisco complaining of starvation, which feels pulled straight from the pages of the original 15th century version, we are surprisingly transported to modern Naples to meet Enrico and his gang at a dingy pizza parlor. Location and era, along with language create a stark contrast from the early, ethereal moments spent with Paulo. While our introduction to the saint is given in flowered, poetic language, and poetry is even followed into the parlor as Enrico’s lover Celia composes sonnets on the spot, Enrico and his gang are devoid of eloquence – speaking passionately, but in layman’s terms – using modern slang and curses which were certainly additions to the original script. Throughout, it is hard to determine why some poetic language was preserved while other sections seem rewritten into the modern entirely. 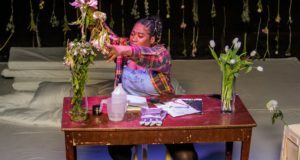 This conceit was often distracting, inconsistent and hard to follow – and the attempt to create a cohesive update doesn’t really bring anything new to light about the subject of the play. 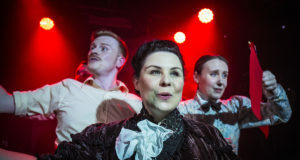 Despite working with a difficult, albeit interesting concept, the cast proved to be a strong, captivating force throughout the show’s two-and-a-half-hour run. Actors were able to deliver moments of comedy and drama with energy and intensity, and it was certainly the efforts of these actors that most encouraged the audience to connect and look forward to what was going to happen throughout the play. In a script which seems originally intended to be a fable about the value of faith, creating a multi-faceted, modern human being from a textual representation of good or bad is no easy fit, and both leading men (Sebastian Armesto as Paulo and Bertie Carvel as Enrico) successfully gave us insight into the complexities and layers of the individuals they portrayed. The supporting cast, as well, did a fantastic job of creating dynamics and carrying us through the dense material. There are elements to be admired about Damned by Despair – again, many congratulations to the fine cast and designers – however, the show won’t be for all audiences, and certainly produces a sense of suspension as it struggles to reconcile archaic religious ideals to modern settings and language. The story’s eventual moral – that doubt will condemn while faith saves, and good works count for very little when it comes to eternal salvation – will more than likely (and rightly) offend most modern thinkers, and may seem overall an unrelatable theme in our world despite the effort to bring it closer to home. Damned by Despair runs at the National Theatre until 17th December 2012.